Diabetes has had an awful impact upon our lives and those of our families and our friends. This is one of the reasons why we came up with the concept of the Dietary Edition of The Ultimate Food App. So when Rene’s friend Alicia at Jim’s Supply Company sent an appeal to support the Walk to Cure Juvenile Diabetes, we had to do whatever we could to help! 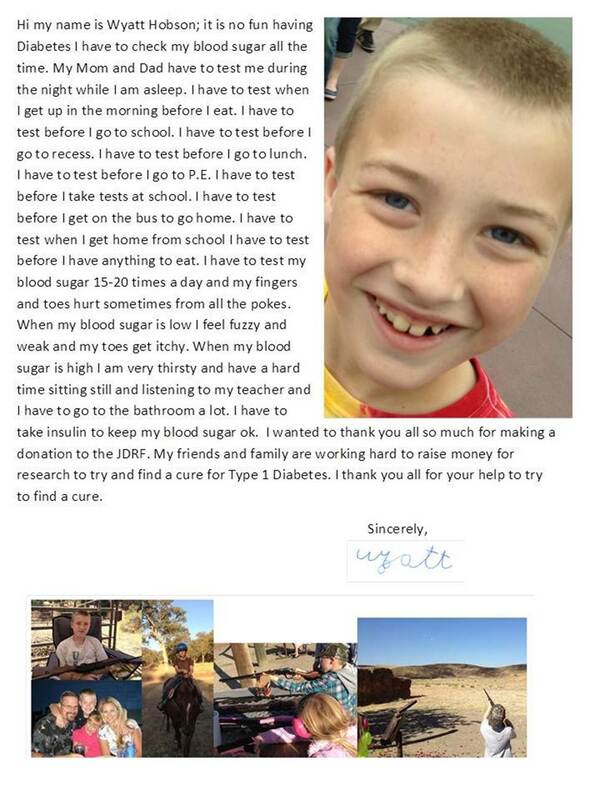 The picture and letter below come from Wyatt, the son of their Operations Manager. Note that anyone can contribute to this cause, no matter where you live. JDRF is the leading global organization focused on type 1 diabetes (T1D) research. Members of Jim’s Supply Company have been personally touched and affected by juvenile diabetes. We are a proud sponsor of the Bakersfield Walk which will be held Saturday, 11/3 at Yokut’s Park. Please help support Juvenile Diabetes by visiting our team page at http://www2.jdrf.org/site/TR?pg=team&fr_id=1889&team_id=61384 and clicking on “donate to this team”. Thank you! ← Who is Your Favorite TV or Web Celebrity Foodie?